In some situations employees leave companies and the organization has not fully prepared for their exit. One specific scenario when an employee leaves that causes a great deal of extra work on IBM Cognos administrators involves the ex-employee's scheduled jobs, reports, etc. Let's say that Ed has configured many scheduled jobs and reports that go out to a number of people, but he has left the company. Shortly after Ed's last day, several of these people are not receiving their scheduled Cognos reports. These employees contact their administrator. The administrator investigates and sees that these specific failed reports are attempting to use Ed's account and since he has left the company, his account in LDAP is inactive, causing the reports to fail. In IBM Cognos, schedules are associated with a "credential," which is a security token that is associated with a Cognos user. In this case, Ed's schedules execute and authenticate through his credential. His stored credential passes to the authentication source (e.g. LDAP, Active Directory, etc.) to get logged in. After an employee leaves, their account becomes inactive in LDAP, AD, or the like, and all of their many scheduled jobs and reports will fail. The Cognos admin is then tasked with figuring out how to find and then reassign all of the ex-employee's schedules. In Cognos, there is no easy way to do this. There is no search feature that allows you to find all schedules that use a specific Cognos user's credential. 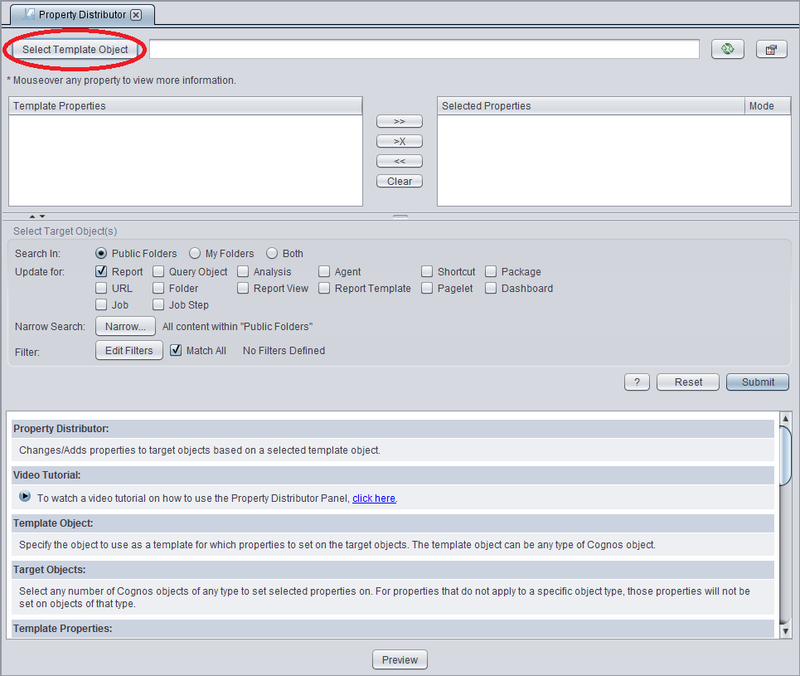 Have you ever needed to update the parameters for a large number of report views? This can be very time consuming in Cognos Connection. For example, imagine a report which expects 15 parameters (normally populated via its prompt screen). Since filling out 15 parameters each time they execute this report is a bit taxing, its pretty common place for users to save report views of this report (to capture all of their parameter selections, and make launching the report much easier in the future). 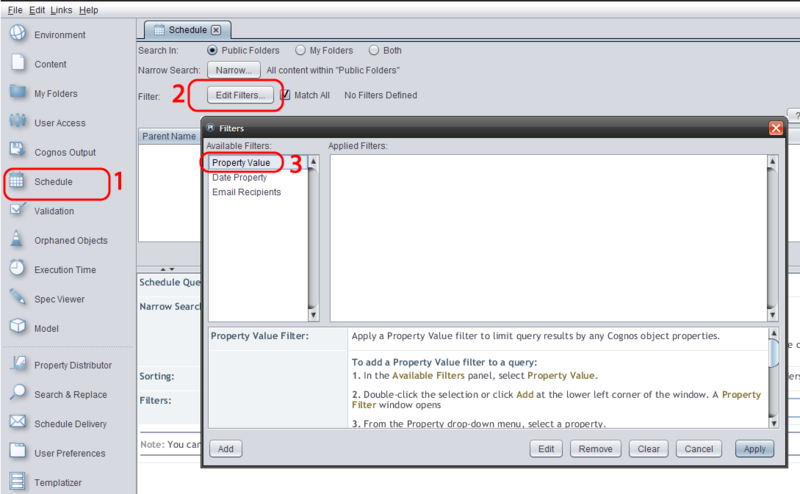 With MotioPI Pro's Property Distributor you have the ability to modify the properties on any Cognos object in bulk. In today's example, we'll use this feature to update the package associated with multiple Cognos reports in one fell swoop. As a Cognos modeler I'm sure many of you have had this experience: After your latest round of model updates, you publish a new version of a package from Framework Manager. This new version of the package accidentally breaks a ton of reports. Let's face it - this is pretty easy to do (especially for reports you haven't thought about in a while). Wouldn't it be nice if you could press a button and batch validate all Cognos reports which are associated with this package...? MotioPI gives you the ability to search for schedules associated with reports, jobs, report views, and query objects in Cognos. Have you ever needed to update an image or change the footer text on hundreds of reports? Have you ever refactored your framework model and needed to change the query item names across all reports which are built on it? Have you ever renamed a report that is referenced as a drill target in many other reports?